The Roc Illetas Hotel was renovated in 1998 and holds 234 rooms including 58 apartments/studios. There are a wide range of leisure facilities within the hotel including indoor pool, jacuzzi and sauna. Acommodation was excellent! Apartment had airconditioning and that was necessary, it was hot at this time of year. There were everything you need in the apartment, but it was a bit old and smelled of cigarettes. Ocean view from balcony was stunning! Breakfast was very good and plentiful! Hotel was nice and clean, apartment was cleaned every day. 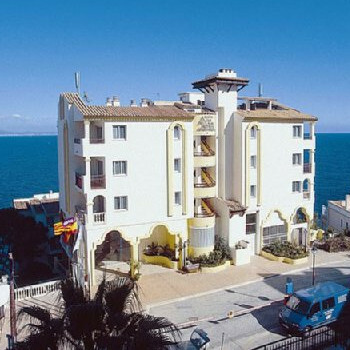 The hotel is located in a beautiful place next to the ocean. The surroundings are green and peaceful. But you should know there are many steps! If you want to go to the beach or pool area you must take the steps, no elevators there. Pool area is great, not too crowded and with free sunbeds. From this area you can also reach the ocean, it's not a beach but there are ladders down to the ocean. Very nice! And clean wonderful water! Sandy beach is 5-10 min walk away. Hotel staff were helpful and nice. There were diffrent kind of entertainment most nights, for example piano concert and flamenco. It was not loud and stopped very early. But if you like to entertain yourself, then Palma is 15 minutes away! Hotel is really charming, I would definitely go back!